Well, here we are at the end of September with Autumn fast approaching, at least it is here in the UK. We have just returned from a river cruise with great friends along the Danube, starting in Budapest and finishing after a coach journey in Prague. My plan is to start this blog off with some quick watercolours painted on the cruise and then add some more as updates later on. For those interested in the technical side of the watercolours, the originals are mostly are about 12 by 7 inches, and are painted on Arches 300lb cold pressed paper. Alas, the weather wasn’t brilliant but the sights along the way and in the cities we visited were lovely. 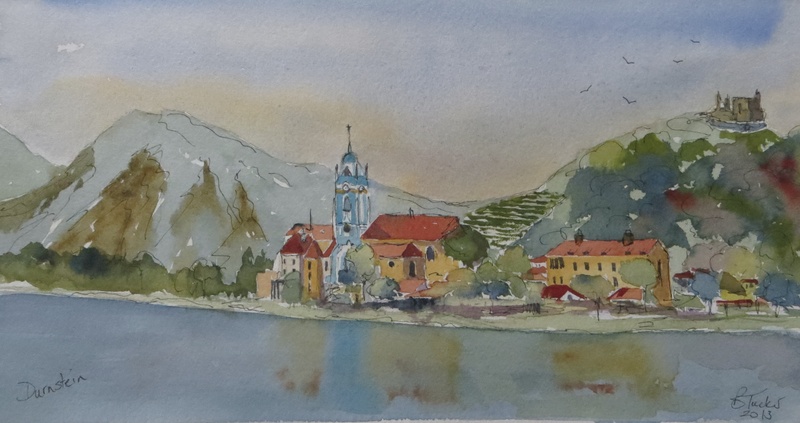 Of course the Danube is not at all blue but my watercolours do show the area with finer weather and a nice blue tinge to the water. At least watercolours can improve the weather, unlike the photos! Budapest is always a fine city,with Pest on side of the river and old Buda rising above on the other bank. Visit the market if you are there as well as the old parts on the towns. To get up to Buda always use the funicular railway from the end of the Chain bridge. It is great ride. The view across to the Pest portion of Budapest from the Buda castle. Old Buda and the Chain bridge, viewed from the Pest side of the City. This time we also spent a morning at a little riverside town about 12 miles away called Zentendre, (Saint Andrews). This is delightful spot well worth the visit with is incredible marzipan museum and lovely Churches and streets. The Danube was quite high when were on it but thankfully not flooding as it had in June of this year. From Budapest our first major City visited was Bratislava. Unlike Budapest we had not visited Bratislava before. It is a delightful, compact city with interesting buildings and palaces to visit. The city is dominated by a huge castle, very visible from the river as shown in this next painting. I regret I didn’t walk right up to the castle, as from there the views of the city must be great. From Bratislave our next stop was at Vienna. Vienna is such a magnificent City. Everwhere you go there are tremendous houses, Palaces and Museums. My paintings of Vienna will be part of the update to this blog so I hope you will see them in while. However while in Vienna do eat the wonderful cakes and, as we did, find some great Wiener Schnitzel ! From Vienna the Danube passes many pleasant towns and villages and soon we were at Durnstein, a “Chocolate Box” town right on the bank of the river. It has a beautiful Church and Monastery and a ruined castle above the town where Richard I of England (Richard the Lionheart) was held captive in 1193. After Durnstein the Danube passes through the beautiful Wachau valley with it’s Churches, towns and castles. Often these are perched high above the river, where they have commanding views of the river. The Wachau valley is the Danube as one might imagine it and soon Melk Abbey comes into view. Regrettably we didn’t have time to stop and visit it on this cruise but I do believe it is magnificent. It is certainly huge and can be seen for some distance as you pass along the river. From the large locks near Melk the journey to Linz is quite short. Linz, the town famous for the creation of Linzer torte, we took a side tour to Cesky krumlov in the Czech republic. 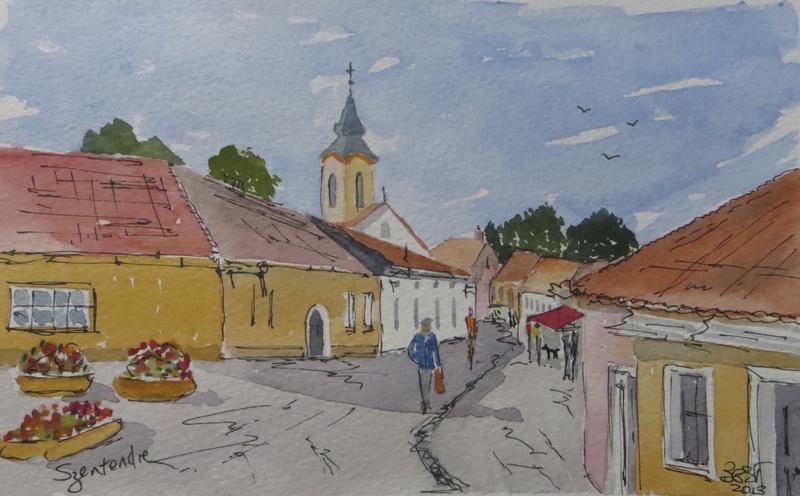 An alternative would have been a trip to Salzburg, but as we had visited there before (painting done some time ago below) we decided on Cesky Krumlov. We were not dissappointed. Cesky Krumlov turned out to be gem of a town, located on an ox bow bend of the river Vitava with huge and very original castle and delightful town around it. If you are in this area do visit Cesky, you will really enjoy it. From Linz we then departed Austria for Passua in Germany. Passau is at the confluence of three rivers, the Danube from the west, the Inn from the south and the Liz from the north. As a result it has seen a number of severe floods with this year in June being the worst ever recorded. It is amazing how quickly the city has recovered, no doubt through much hard work. In St Stephen’s Cathedral is the world’s largest cathedral organ with over 17000 pipes. Every day at 12 noon a 30 minute concert is played and is well worth going to,the sounds are amazing. 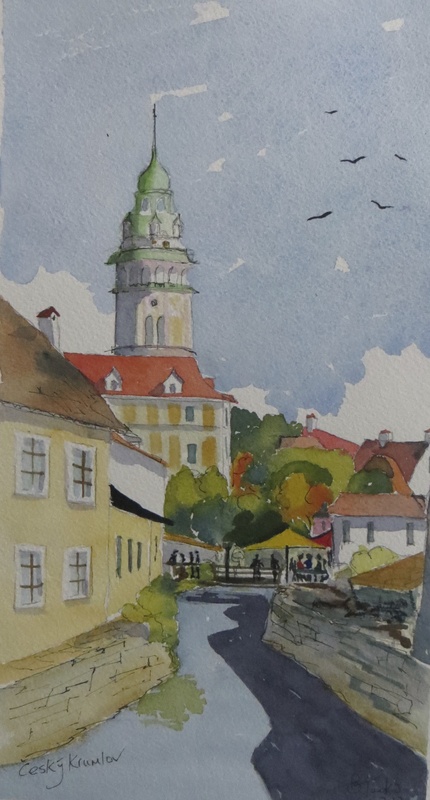 Paintings of Passau too will be the subject of part 2 of this blog. From Passau we travelled on to Regensburg, not all the way unfortunately on the Danube as water levels were too high, so the last part had to be by coach. Regensburg, in Germany is lovely , and again compact city, with a great history. More paintings to come later on. From Regensburg we then travelled to Prague for a couple of days. 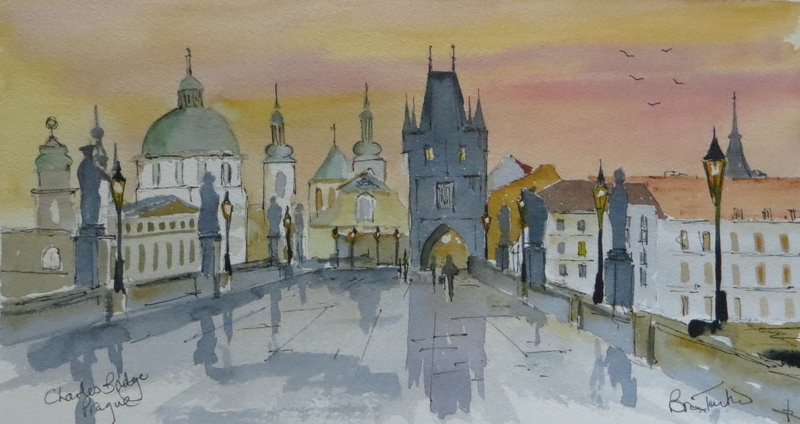 Prague is nowadays a very busy City , and sadly the throngs of people limit the charm of the Old Town Square and the Charles bridge. However it does have great sights to see and the view of the Charles Bridge is always terrific, both in the day and at night. I don’t think this quick sketch of Old Town Square does it justice but over the next few months I will have the chance to paint some more views of this fine city. And so our holiday came to an end, great time with our great friends, roll on the next one! I hope you have enjoyed these early watercolours of our trip. 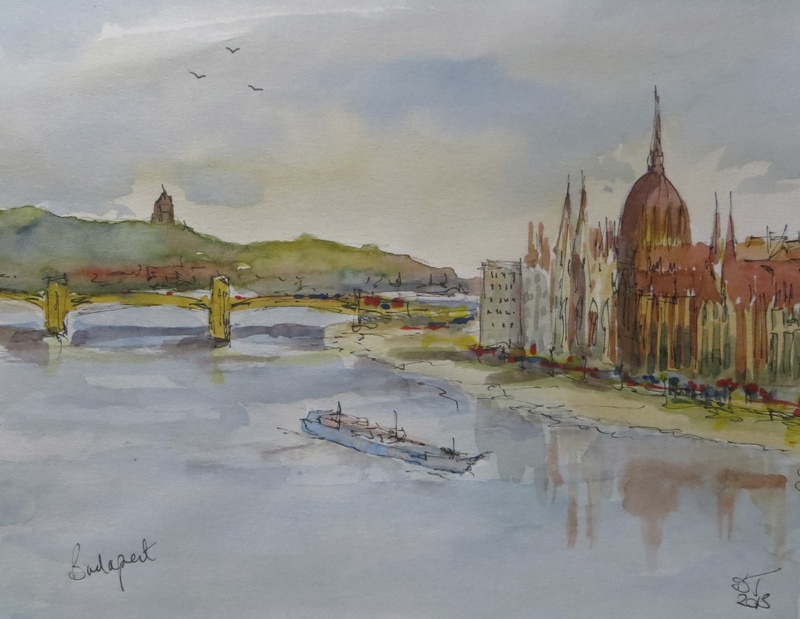 They gave me much pleasure painting them and they may recall your own memories of the beautiful river Danube and the countries it passes through.